NAC was beaten by the University of Northampton Archery Team (Stallions) at a Portsmouth shoot held at Everdon Hall on 14th April 2018. The teams – consisting of 12 archers – had to shoot against each archer’s personal best. The personal best score was deducted from 600 resulting in a handicap which was then added to final actual scores. This overcame the issues of different bow styles, gender and age categories, and made for a less cluttered final array of positions. 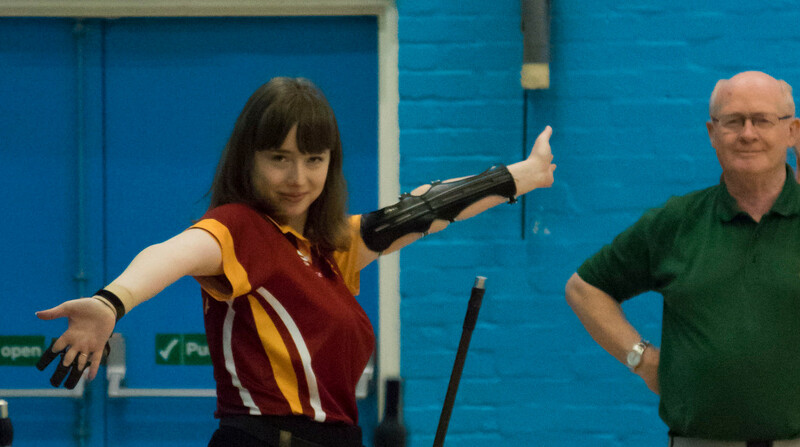 The overall individual winner was barebow archer Monika Prchalova of UON with a calculated score of 622, an actual score of 481 – beating her previous personal best of 451. NAC’s best archer of the day was barebow archer, Paul Walters, with a final calculated score of 615, beating his previous best of 425 by 15 points. He took third position having been beaten by Kelly Brown – barebow archer of UON. The team result showed a similar picture, with UON’s top three archers of Monika, Kelly and Hetty O’Donaghue achieving a score of 1848 against NAC’s Paul Waters, Andy Hiscocks and Paul Dwyer score of 1790. The ladies ruled the day! After the shoot everyone convened to the students bar for a good lunch and presentation of medals. The event was brilliant fun, competitive, but relaxed – with some flamboyance! Thanks to Caroline Chant (NAC and UON member) for organising and judging the event and to Nicol Parajova for taking some great pictures soon to be published on our web-site. The full results can be found here. Perhaps NAC will do better next year in a further Uni Challenge. 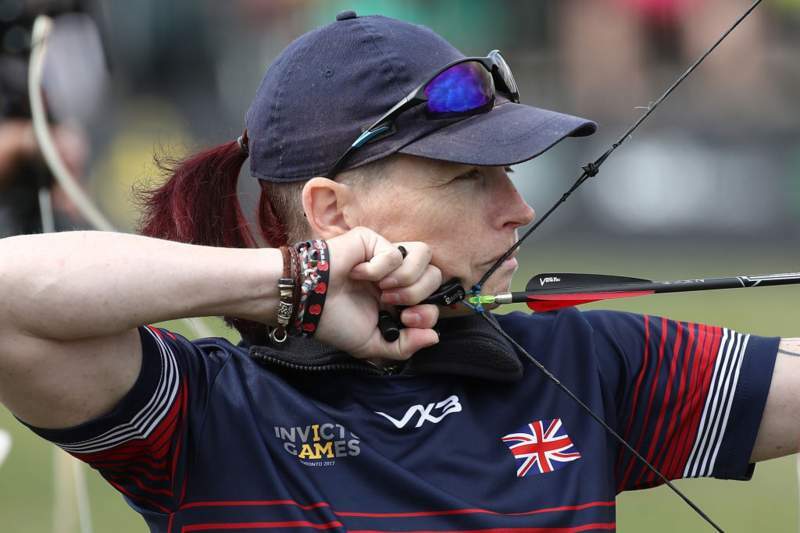 Absolutely fantastic – NAC Archer Kerys Knight – representing the UK at the Invictus Games this year – won a Gold in the women’s compound finals at Toronto on Friday 29th September. Kerys beat US archer Kyle Burnett (silver) and Canada’s Bettina Fuchs (bronze). Later the same day she joined up with Olaf Jones and Chris McFadyen in the Team compound and took a bronze, the UK being pipped by the USA (silver) and Romania (gold). Kerys also won a bronze in the women’s lightweight powerlifting held on Monday 25th, being beaten by Australia (silver) and USA (gold). Kerys has served her country well and done the UK, Northamptonshire and NAC proud. What a brilliant achievement.Well done Kerys. Susan Corless of NAC has been selected to represent Great Britain at the World Archery Championships being held in Mexico 16th to 22nd October 2017. Susan has been shooting for just 6 years, and in fact only 3 years in the Compound category. James Mason, also a former member of NAC, has also been selected. Well done to all who shot in the Interclub Challenge, run outdoors this season between four clubs in the County. 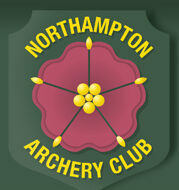 Northampton AC came third overall, and it was great to see archers shooting rounds they had never tried before. 22 archers from NAC took part. After the American round (Round 1) at Wellingborough we were down in 4th place, behind the leaders, Long Buckby AC, with Wellingborough OAC 2nd and Kettering AC in 3rd. Mick Lovell was our top scorer with 646, coming 3rd overall behind two Compound archers, so great shooting from Mick. The Field shoot at Daventry (Round 2) was hosted by LBAC. Here we did a lot better and came first with 260 points in front of LBAC, with KAC in 3rd and WOAC in 4th. This raised us to 3rd overall, only 4 points behind 2nd place. Dave Quemby shot the highest score of the day with a 193. The Clout, Round 3, saw NAC in 2nd place behind KAC, LBAC in 3rd and WOAC in 4th. This left us still in 3rd place overall – now 28 points behind second place, and 412 points behind first place. NAC’s young Hazel Dalley, showed up all the Northampton crew by shooting the highest score for the team with 103, which was 8th overall and maybe a county record. Excellent shooting Hazel. In the final round – the Pope Young, at our home ground – Sywell, Northampton AC did well coming in 2nd – 253 points behind Kettering, the winners of this round. LBAC were in 3rd and WOAC in 4th. There was outstanding shoot from NAC’s top shooter for the day – Paul Walters with a score of 156 – 2nd overall by 2 points. First – Kettering 6284, Second – Long Buckby 6261, Third – Northampton 6003 and Fourth – Wellingborough 5216, Congratulations to Kettering. It was an excellent series and everyone enjoyed the fun of the challenge. Look out for next years, hope you will enter again. Thanks to Dave Q for the write up. Congratulations go to NAC Junior Compound Archer, George Bond who has been selected to represent the County for the first time at “The Sydney Bond Tournament’ to be held on Sunday 23rd July 2017 at Lincoln Archers, Washingborough, Lincoln. He will be shooting Bristol Rounds at this Record Status Shoot. All the best George. In the meantime at The Archery GB National Series – Stage 3 hosted by the County of Surrey Archery Association at Kingston University, Surrey from 08-07-2017 to 8-07-2017, Susan Corless senior compound of our Club won stage 3, and is now sitting 3rd in the overall rankings – there are two more stages to go. Well done Susan. NAC compound archer, Kerys Knight has been selected to represent the United Kingdom in the Invictus Games. The UK team announcement was made today – 30th May, and represents another great bit of news for both her and NAC. We must be proud of her. Kerys served in the Army and was discharged in 1991. She has nerve damage in her lower left leg and has to use crutches to help her walk, which has resulted in spinal and neck issues. 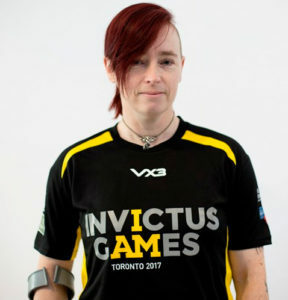 Kerys has been selected in archery and powerlifting, and sees the Invictus Games as a way for her to progress in life. “I was devastated when my Army career was cut short due to injury during training. Since I was forced to give up my dream, I have always returned to the despair of never having fulfilled my passion to serve my country. Being a part of Invictus 2017 will give me a real purpose, which will help my self-esteem and self-worth, thereby improving my mental health; specifically my anxiety and depression. Representing my country is a goal I can focus and build on to pull forward other aspects of my life.” Visit the “Help for Heroes” Support Page. Photo and write up from “Help for Heroes”.